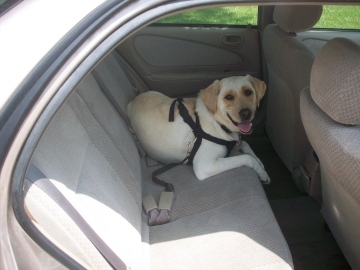 Note: Dawn Ross of the Pet Auto Safety blog shares her tips on how to help a dog that doesn’t like riding in the car. What is the typical image that comes to mind when you think of a dog in the car? It’s the dog with his head out the window and a big, puppy grin on his face, right? But for whatever reasons (bad experience, unfamiliarity, fearful tendencies, for example) some dogs really do not like riding in the car. If you have such a dog, here are some things that can help. The number one thing you can do to help a dog that is afraid of car rides is to introduce him to the car slowly and positively. People don’t overcome their fears overnight, so don’t expect these training tips to “cure” your dog of his fear instantly either. The following steps will take time (days, weeks or longer), and it is even possible that your dog will never come to like riding in the car. But in the long run, dog training methods using desensitization, counter conditioning, and positive reinforcement can go a long way to help reduce your dog’s anxiety. 1. Introduce your dog to the outside of the car. Introduce your dog to the car from the outside, but don’t take him in the car. Walk around it, let your dog sniff it, and reward him with treats or his favorite toy. If you use clicker training, click and reward. If you use your voice, praise in an upbeat tone. Always keep your voice upbeat. 2. Sit in the car without the car running. Once your dog is secure with step 1, sit in the car with him but don’t turn the car on. Get him to play if you can or just sit quietly and reward him with treats. Be careful about soothing (more on that below). 3. Sit in the car with the car running. Make sure your dog is comfortable with step 1 and 2, then sit in the car with the car running but don’t go anywhere (make sure your car is outside and not in the garage in order to prevent carbon monoxide poisoning). If it is just you training your dog, sit at the wheel and have your dog sit where you are going to expect him to sit when you drive. Since you’re not driving, it is OK to distract your dog with treats or toys. Once it seems your dog has gotten used to being in your car when it’s running, take short drives around town. If possible, avoid too much turning as this can cause car sickness. Go to the drive-through at your bank or favorite fast food place. Visit a park or a pet store. Make sure your destination is not a place your dog hates, like the groomer or vet office. And make sure you never leave your dog alone in the car while you run errands. 5. Make your trips a bit longer. At this point, you can start to make the road trips longer and longer. Remember, the more frequently you do these steps, the better. For example, do step 1 three times a day every day for weeks, if needed, before moving onto the next step. Once you get to step 4, try to do it once a day or a few times a week. The amount of time it takes for each step depends on your consistency and on your dog’s level of fear of car rides. Some dogs feel more comfortable in a den-like enclosure. If your dog is already crate trained, using the familiarity of her own “den” can add to her comfort. Sometimes dogs don’t like to ride in the car because they keep sliding off the seat when you take a turn or stop. A pet travel crate can also help with this. Incidentally, so can a dog car seat belt. Learn more about these products here and here. Your dog will probably be much more comfortable in the car if there is something he is familiar with such as his own pet bed or a few toys. There are a number of medications, dog appeasing pheromones (DAP), natural herbal remedies and anxiety wraps that claim to help dogs be calmer. Your vet may be able to provide a calming medication with L-Theanine, Benzodiazepines or other types of pet anxiety drugs. For natural, herbal essential oils and aromatherapy, look for ingredients like chamomile, rockrose, lavender, valerian root or bergamot. Two great examples of natural pet anxiety remedies include Rescue Remedy and one specifically for dogs with anxiety about car rides – Travel Calm. Anxiety wraps include the Thundershirt, Rein Coat and others. 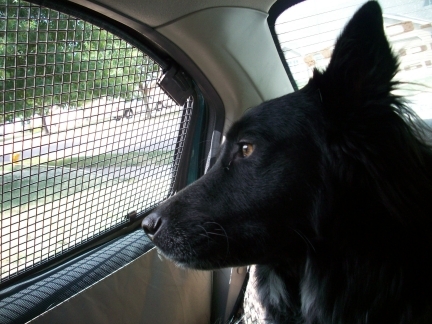 A fresh breeze in the car can help to reduce the anxiety of some dogs when they ride in the car, so roll down a window. Also, some dogs don’t like riding in the car because they get car sick. Making sure they can see out the window can help to alleviate car sickness. If you have a small dog, consider a dog car booster seat. Music can do wonders for people, and believe it or not it can do wonders for a dog too. Piano music has been shown to be soothing to dogs. In fact, Through a Dog’s Ear has a number of CDs to help dogs with anxieties and other issues. 6. Someone in the back seat. Having someone your dog knows in the back seat can be very helpful to a dog that doesn’t like riding in the car. They can help calm the dog with a massage, t-touch techniques, or just to simply distract the dog with toys. Be careful about soothing the dog too much. It is suspected that soothing a dog confirms that the car is something to be afraid of. The person in the back of the car should make sure that their own emotions are calm and that they behave as naturally as possible so as not to give the wrong message. Every dog is different, so some dogs may respond to training faster than others. And some dogs do very well with pet anxiety remedies while on others they don’t work at all. Find what works best for your dog, and then perhaps someday your dog will come to love riding in the car. What has helped your dog learn to like (or put up with) the car? Those are great tips which I hope I never need. I’ve never had a dog who wasn’t totally happy to go for a car ride. I sometimes worry that I am taking them to the vet or the groomer too often and they will forget the fun times. My dog has always liked the car too, but he does get a little too excited/anxious sometimes. Not due to fear, but to being overly excited. Mom is happy that we all have always liked the car and no one has gotten car sick. We start early as soon as Mom adopts us and try to get out for a ride at least once a week. Even in the summer heat, we travel from home to just one destination and then back home again. That’s great advice, just getting puppies and young dogs into the car at least once a week or so to go somewhere fun. I did that with Ace too, but thankfully he seemed to like the car already when I adopted him. Not too much work on my part! Good tips! Norman is not always too fond of the car and definitely does not enjoy getting in the car. I always take my time and use really yummy treats that he only gets for this occasion. I try to encourage him to at least put his front paws up but if he needs help, he gets it. In the jeep we have the back seat down so it is big and flat. The unsteadiness really worries him so I lined it with memory foam dog beds which helps a TON. He also likes to look out the back window vs the side windows to I always make sure he has access to the back. Thanks for those ideas. I had no idea Norman is not a fan of the car! I could have used this post a couple of years ago when we first got Faolan. He was pitiful in the car. Fortunately he is fine now, but it was rough for the first year or so. Thanks for all the helpful tips, as usual! My two year old Chihuahua mix likes the car all right, but always gets motion sick if the ride is long, 2 hours or more. I have her in a kennel as she would be bouncing off the windows if she were not restrained and I do not want her on me while I drive. I think it is because she cannot see. I have tried an herbal supplement from Nutri-Vet specifically for car sickness, but it did not help at all. I have looked at dog car seats (booster seats) but they are expensive and I am not sure she would be able to see anyway. Any other ideas? I know Dawn, the author of this post, has recommended booster seats in the past to help with car sickness. I will reach out to her and see if she can comment on your questions. I actually did the opposite with my cat Beamer. When we first took him in the car, he got very car sick, and we kept him in his kennel. What helped for him was to not feed him the morning before a trip, and also to keep a towel over his kennel so he couldn’t see out at all. But that’s just one example. These are some awesome tips on how to ease a car-phobic dog into travelling. I especially like that you’ve mentioned the ways to slowly introduce your dog to the sights, smells and sounds of the car. Although these are familiar to you and I, a puppy or a dog who hasn’t been in a car much will see them differently. In the same way that many dogs find the vacuum cleaner terrifying! You’ve also mentioned that it’s good to do short trips. I believe this is important as it can help them to understand that not all trips are long and uncomfortable. Donna loves the car… she can’t wait to get on it. If I try to walk her away from the car, she would stop and plaster herself on the road because she wants to go towards the car. Doesn’t need to be our car either, can be anybody’s car as long as she gets driven somewhere. I think she associates the car with going to new, fun places, that’s why. Cookie is funny. She can’t wait to get into the truck when coming from the house (we’re going somewhere); when at the farm, she won’t get anywhere near it (the fun is over). My dog Leela has had some major anxiety and car sickness issues. I’m going to give these tips a try and see if they don’t help her out. Thanks for the fantastic article! Dawn shared some great tips! Hopefully you see a difference soon with your dog. I’m so glad that Lola & Rio love car rides. But we had two shelties growing up, neither of which really enjoyed car rides. One of them would get sick and actually throw up where the other one would just become really anxious and stress himself out. Poor guys. Aww, poor guys. Glad Rio and Lola don’t have any issues. We are taking smaller, fun trips, I roll down the window, and whenever possible, bring Roxy (my other dog who LOVES car rides). I think her joy distracts him and he forgets that he may get sick. Thank you. This will be helpful for others who are dealing with potentially car-sick pups. I need to give some of these tactics a try. I keep hoping that my pup is less stressed going for road trips. So far it has been a pretty bumpy ride. It has not been easy for her from her first trip home in a small soft sided kennel. I know she would rather be held but I drive alone for the most part. I don’t want to start that and worry it would interfere with driving. I gave up on the carrier and tried a puppy car seat that she can move around in next to me but still be secured inside. It is better but not a complete win. Toys are ignored and even chewies don’t get a second glance. I have thundershirt from my last dog that I can try. I hope something helps her soon.